What’s not to love about the Rocks Off RO-80mm Rainbow Bullet? With seven vibration settings, you’ll have plenty of fun exploring everything this toy has in store for you. 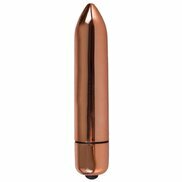 Discreet, portable and stylish, this bullet will become your immediate go-to for pure satisfaction. Fully waterproof, you're free to light a few candles and spice up your long soak in the bath. You’ll be left shaking every time. I am hard to get off I don't react as well as I should or maybe you not trying hard enough ;),this is really good!! highly recommend for people who find it hard to get off.Solo or with a partner it's great. 7 patterns/speeds and oh my god is it amazing! I didnt think my little bullet could get any better but it just did, highly reccomend for single and couple play.... seriously.... buy one now! you will not regret it!